To specialize in the bass saxophone is in itself an unusual and likely unique idea. Rotterdam resident Klaas Hekman has chosen this path for the past twenty-five years and is undeniably 'the' master of this instrument. His beginnings, nearly thirty years ago, as a graduate of the Royal Academy of Music in The Hague are surprisingly on flute. His destiny however was ensured at a 1980 meeting in London with Lol Coxhill, when he saw a bass saxophone in a music shop. He was fascinated by this enormous instrument, purchased it and the rest is, as the expression goes, history. Over the ensuing years his illustrious portfolio has included events with large saxophone ensembles, theatre productions, dance music from Surinam, and in more recent years collaborations with numerous players including trumpeter Roy Campbell, and with Intermission, a music project for three double basses and one bass saxophone: Hideji Taninaka, William Parker and Wilbert de Joode on the double basses. Intermission has also performed with the English guitar legend Derek Bailey, pianist Chris Burn and (electronic) composer Gilius van Bergeijk. A recording from 2004 (Yolo - Strotbrock 501) presents him solo, illustrating the brilliance of his playing. Howard Reich in the Chicago Tribune wrote: "How one man can produce so much thunderous sound from so unwieldy an instrument almost defies comprehension. But Hekman's solos proved so majestic in scope, searing in tone and coherent in structure as to represent self-contained artistic statements in their own right." Bill Smith. Imagine the sound, Dutch adventures 2, August 8 2005. Van de bassaxofoon je specialisatie maken is op zich een ongewoon en waarschijnlijk uniek plan. De Rotterdammer Klaas Hekman koos deze weg de afgelopen 25 jaar en is onmiskenbaar DE meester op dit instrument. Verrassend genoeg begon hij zo’n dertig jaar geleden, na afgestudeerd te zijn aan het Koninklijk Conservatorium in Den Haag, op fluit. Maar zijn toekomst werd bepaald in 1980 tijdens een ontmoeting met Lol Coxhill in Londen, toen hij een bassaxofoon ontdekte in een muziekwinkel. Hij werd gegrepen door het instrument, schafte het aan en de rest is, zoals de uitdrukking luidt, geschiedenis. De daaropvolgende jaren groeide zijn luisterrijke staat van dienst met grote saxofoonensembles, theaterproducties en dansmuziek uit Suriname. De laatste jaren speelde hij samen met allerlei muzikanten, onder wie trompettist Roy Campbell. Ook richtte hij Intermission op, een muziekproject voor drie contrabassen en één bassaxofoon; met bassisten Hideji Taninaka, William Parker en Wilbert de Joode. Intermission trad onder andere op met de engelse gitaarlegende Derek Bailey, pianist Chris Burn en (electronische) componist Gilius van Bergeijk. Hekmans briljante solospel is te horen op de CD Yolo uit 2004 (Strotbrock 501). 1977: graduated as a flute player and music teacher on the Royal Academy of Music in Den Haag, Netherlands. Art Foundation in his home town Rotterdam, and took part in the then flourishing street theater and street music scene. 1980: During a meeting in London with the English soprano saxophonist Lol Coxhill, I saw a bass saxophone in the show window of a music shop. I was fascinated by the huge instrument, I bought it and ever since I specialised in this instrument. 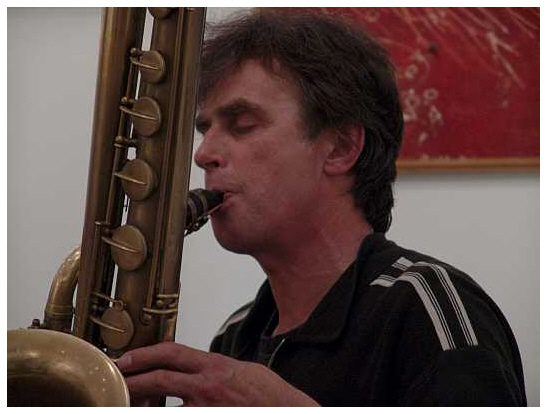 1981: together with the Dutch composer of electronic music Gilius van Bergeijk we composed `Signals', a piece for 25 saxophones including the contrabass saxophone, and 5 ship horns. It was performed in the harbour of Rotterdam. 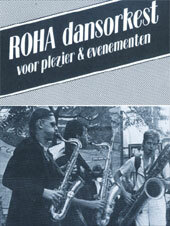 1981-1984: I organised and took part in several music and theater productions for the Roha Foundation: `The Lost Chord', a music theater production, Roha Bigband, Roha Dance Orchestra. `The Six Winds', with John Tchicai on tenor saxophone. 1988: composition for a large ensemble and trains, which was performed on the railway station Rotterdam Blaak. Since 1988 I have been working together with the New York trumpeter Roy Campbell jr. We toured with Black Tulip Transit with Han Bennink on drums, through Holland four times. 1990: I took part in an exchange project New York - Rotterdam. During this project I met Hideji Taninaka. In 1992 I invited Hideji Taninaka to join the `Black Tulip Transit' Tour in Holland. 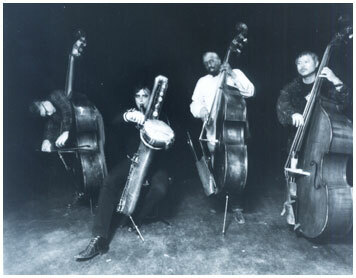 1994: I initiated `Intermission', a music project for three double basses and one bass saxophone. Hideji Taninaka, William Parker and Wilbert de Joode on the double basses. `Intermission' succesfully toured Holland twice. In 1996 Intermission's first CD 'Song of Low Songs' was produced.It got a **** review(four star) in DOWN BEAT(octtober 1997). The repertoire stams from and elaborates on the many forms of world windmusic in which improvisation and dancebility prevail. Their first CD 'Kownu Boy e Dansi got good reviews and good respons. We have toured Europe (Belgium,France and Portugal). 1997: de Nazaten van Prins Hendrik played on the North Sea Jazzfestival. 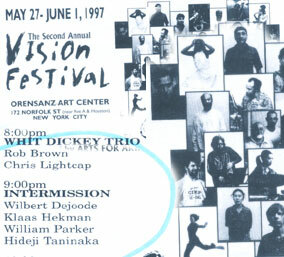 June 1997 Intermission performed on the second annual VISION Festival in New York. October 1997 Intermission toured Japan. We played in Kobe, Kyoto, Kanazawa and Toyama. 1997: I made a new CD with saxophone sextet The Six Winds called Manestraal. My composition ' Kurk' dedicated to Roland Rashaan Kirk got good reviews. April 1998 Intermission performed with the English guitar legend and in and out improviser Derek Bailey, pianist Chris Burn and (electronic)composer Gilius van Bergeijk. June 1999 the CD Unanswered Questions is released. BV HAAST 9906. 1998: I initiated a project called Rake Klappen (litt.Hitting Punches). Music and Muay Thai Boxing. It was performed during a summer theatre festival called The Parade in Holland. August 1998: I conducted a workshop in the beautiful landscape of Toscane in Italy. In march 1999 the saxophone sextet Six Winds had a very succesfull tour in Holland with Kazutoki Umezu on alto and Andrew White on tenor. 17-31 october 1999 Intermission toured Japan again. Concerts: together with Tendai Shomyo (traditoinal Buddhism singing in Kanazawa 24-10,Okayama 20-10,Kobe 21-10, Kyoto 22-10,Nagoya 27-10,Yokohama 29-10 and more. Workshops in Italy and Holland. 2001 extended tour with' de Nazaten'and special guest Roy Campbell jr.
2004: Solo-playing at The Empty Bottle Festival in Chicago William Parker/Roy Campbell and Rashid Bakr at the Fusion Art museum New York. 2006: With De Nazaten in televisionshow Vrije Geluiden of the VPRO. De Unie in Rotterdam, Bimhuis Amsterdam, SummerJazzCycleTour in Groningen.